Images Sources: The Weather Network and NASA. 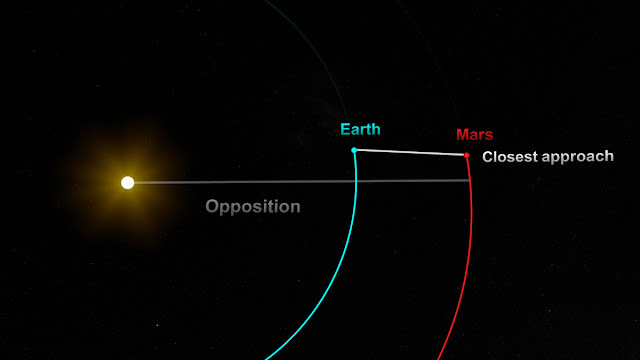 The distance between the Earth and Mars on 31 July 2018 was 35.8 million miles (57.6 million kilometres). Mars will not come so close again to us until 2035. It hung in the sky all summer in the northern hemisphere, an angry orange pinprick. What’s Up for July 2018 (29 June 2018). Video Source: Youtube. The planet was big and bright enough that I could make out its Velveeta colour from my bedroom window. Astrologer Astrolada was relieved when the Red Planet finally faded this autumn; she felt it had been following her for months like "the Eye of Sauron." But I thought it was an unusual opportunity to be more aware of our planetary neighbour, a welcome distraction from the turmoil on Earth. The astronomical aspect lasted long enough to remember that there is a larger theatre. 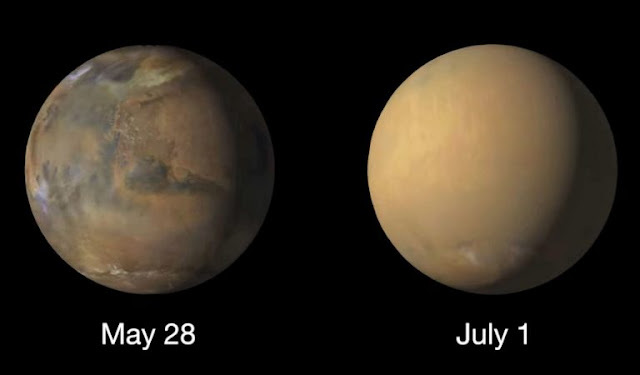 Mars Before and After Dust Storm (19 July 2018). Video Source: Youtube. Add to all these factors a sandstorm which marred the entire Martian surface. This event only occurs every six to eight years. It felt as though the Red Planet was saying, Look at me. Look at me. Then, having gotten our attention, it was trying to tell us something beyond that. But whatever that was, it could only be obscured, because the global storm obliterated all Martian surface features. The planet approached us only as it was totally shrouded. We can more clearly see the differences between what we feel we should do and what we want to do, and this can lead to greater insight into how we’re managing our lives. While Mars is retrograde in Aquarius ... there can be tremendous resistance if things are not going our way. Perhaps ironically, we can become very stuck as we resist situations that are preventing us from having our way or we can become quite stuck on certain ideas and ideals. We may be revisiting old friendships or we may be fixated on past connections that we feel were ideal. There can be pronounced passive-aggressive behavior during this cycle, as it can be challenging to feel as if direct assertions can get us what we want, and this may be more prominent while Mars is retrograde in Capricorn. We can instigate problems or arguments in our search to find a balance. We might stew in anger. This is a time for really getting in touch with what we’ve been accepting on the surface of things, but that has been building inside as emotional slush. Mars retrograde in Capricorn can return us to previous jobs or work projects, traditions, and structures in our lives. Aquarius and Capricorn rule friends, networking, electronics, humanitarianism, community, career, reputation, government, rules, and business, amongst other things. During Mars’ retrograde cycle, we may need to re-assess our approach to these matters. ... This is an excellent period for seeing old problems in a new light." 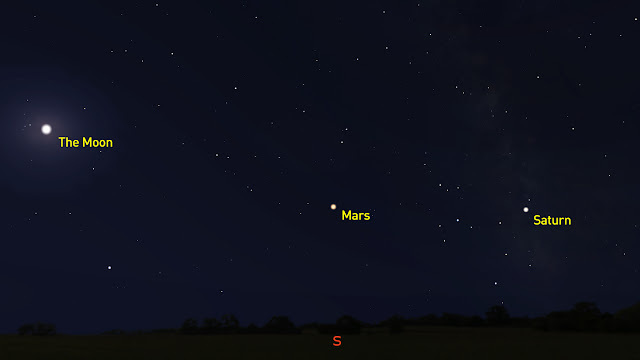 A retrograde is an optical illusion in the night sky so that a planet appears to move backwards as seen from Earth. This illusion remains symbolically important for astrologers, who believe that retrogrades force revisits to the past, as well as inward journeys, especially as related to the allegorical divine energies of each planet. Retrogrades also imply delays, disruptions, resistance, blocks and barriers. Actions, thoughts, communications, and forward progress are hampered. No matter how much you try to solve some problem or thought pattern, it keeps looping back around, and reminds you of a similarly intractable problem from the past. 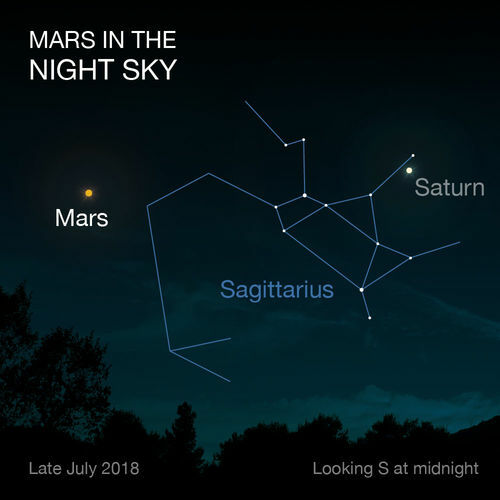 Never more was that the case than this year, when an extraordinary six planets went retrograde all at once in August 2018, with a total of eight retrogrades altogether (Mercury, Venus, Mars, Jupiter, Saturn, Uranus, Neptune and Pluto). Progress under these conditions is attained only through immense, unflagging efforts. 2018 offered pressure-cooker introspection; self-doubt; nagging memories about past relationships; returning to unfinished business; and secrets and suppressed impulses coming to the surface. There were nine planets retrograde if you count the minor planet, Chiron. The latter signifies wounds and illnesses that are not, and cannot be, healed, at least during the retrograde, despite intense therapies and medical treatments. In addition, when the pressure of Mars retrograde finally eased, Venus went retrograde, supposedly weakening feminine energies until 16 November 2018. That meant loveless environments and a lack of compassion, with energies scattered, just when the stress was on. It also indicated relationship concerns, divorces, fights, fetishes, and crazy love affairs, which would turn out by year's end to have been a bad idea. The astrologer David Palmer likened this year's celestial combination to a non-stop military hike uphill through the jungle, with no time for rest or medical treatment, and all your mates in a hostile or dejected frame of mind. Anyone who could not keep slogging would be dropped or abandoned. This might be done in moment of skewed perspective or ill-considered judgement, a cause for regret later, when the confusion cleared. This is all rare and unsual. In short, the whole solar system went retrograde. Even if you think astrology is nonsense, it is still fascinating to think about this phenomenon as an example of distorted perception. 2018 was a year in which the whole solar system appeared to us to be traveling backwards. In the northern hemisphere, astrologers nicknamed this transit, "the Summer of Retrogrades," and they believed that all star signs would be heavily affected. The retrogrades of 2018 will finally clear when Uranus turns direct on 6 January 2019 (or 7 January, depending on where you are). 6 January will coincide with a solar eclipse over China, Russia, the Koreas and Japan. Solar eclipses allow you to plant the seeds for new beginnings. 6 January 2019 also marks the Christian holiday of Epiphany, to be followed by Eastern Orthodox Christmas the next day. On 7 January 2019, you can pat yourself on the back and tell yourself you made it - be astonished by the epiphanies and breakthrough realizations that greet you - and honestly say, Happy New Year.